Navkaar Banquets, Shalimar Bagh, Delhi is a great venue to host your pre-wedding functions, wedding and reception ceremony. The venue is ideal for birthdays, anniversaries and family get-togethers. Navkar Banquet East Delhi is located on Outer Ring Road and near Sheesh Mahal which makes it easily accessible for all to reach there. The venue serves delicious pure vegetarian food to their guests. Navkar Banquet Shalimar Bagh has multiple party areas which makes it easy to have different functions at the same venue. It boasts of beautiful, capacious banquet halls that are perfect for hosting the big fat wedding you've always wished for. 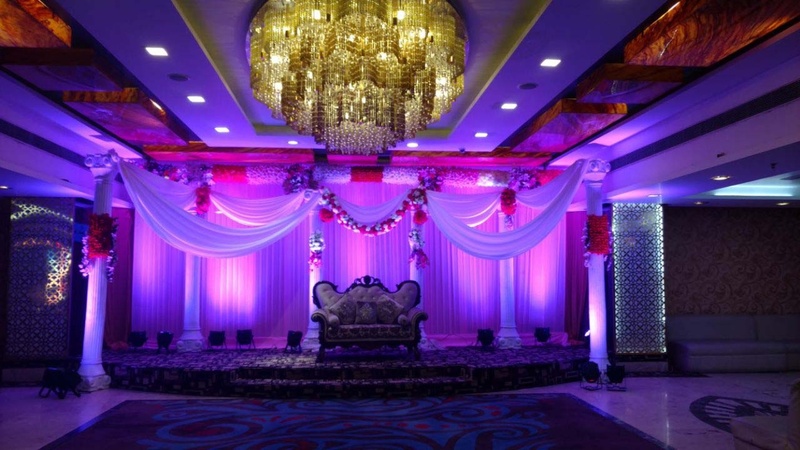 Navkaar Banquet Shalimar Bagh has a huge hanging chandelier makes the venue look elegant. The venue has an inviting ambience which makes your guests feel welcomed. So go ahead and book Navkaar Banquets, East Delhi, Delhi for your upcoming events. The Navkaar Banquets located in Shalimar Bagh, Delhi has Banquet Halls. Hall 1 can accommodate upto 200 guests in seating and 400 guests in floating. Hall 2 can accommodate upto 100 guests in seating and 200 guests in floating. Hall 3 can accommodate upto 60 guests in seating and 100 guests in floating. Vegetarian food is served at this venue. Features of this wedding venues are : Food provided by the venue , Alcohol allowed at the venue , Outside alcohol allowed at the venue , Music allowed late , Halls are air Conditioned , Ample parking , Baarat allowed , Hawan allowed , Overnight wedding allowed , Decor provided by the venue , Packages starts at Rs 1100 per plate for vegetarian menu and at Rs N/A for non veg menu. Decoration starts at Rs 25000.